Ok... this isn't a cure all for a problem that seems to be fairly common with Desert Eagles, but can be caused by any or all of several factors. Here is a post I made basically off topic in another thread, so I am moving this here to continue rather than push the other thread further off topic. There are several things that can cause flat ejections (over the slide). Yes, sometimes it is because the gun is allowed to rotate too much effectively making the top of the gun face your face, so the guns up is not straight back... mostly that gets repeated on the internet by keyboard warriors though, just like limp-wristing causing "most issues", also mostly BS for another thread, but back to topic... the flat ejections I received, and the failures to return to battery were caused by the slide not being able to move freely. Drag on the slide causes more delay, and then too much of the gas impulse is absorbed getting the slide started. Then, in the later part of the slide acceleration, the slide movement in this case is kind of half hearted, even if it makes it far enough back to get another round from the magazine. Ideally, you want it to JUST barely bottom out, for a full run forward for the momentum to get that bolt rotated in hard. So called "limp wristing" is simply a multiplier for an issues like excess friction (from powder residue) and a couple more issues I was able to eliminate from my Desert Eagles. One characteristic of this slightly necked cartridge is that it can wobble a bit more going up the ramp and may end up popping into the chamber ahead of the extractor claw, if the slide isn't very smooth. Then, the energy it takes to defeat the extractor claw spring, to pop it over the rim of the case is quite high. This is the most common issue I have found (in all calibers) that causes failure to return to battery. To test this, just ease your slide down on top of a chambered round and you can see this in action. Further, imagine that the bolt lugs are trying to rotate into place behind the receiver lugs and the front of the extractor claw is hitting the shell. Not only does the claw need to rotate against the brass, it need to be forced outward over the rim of the cartridge during this rotation. Polishing the claw and a very tiny modification I do to mine eliminate this to the point of a really dirty slide and springs. All that grit of powder debris can really slow down a slide... and more lubricant just makes it gummier. I run all of mine with very little lubricants. In this image you can see where the edges of the extractor claw have been deburred a bit, but not too much. 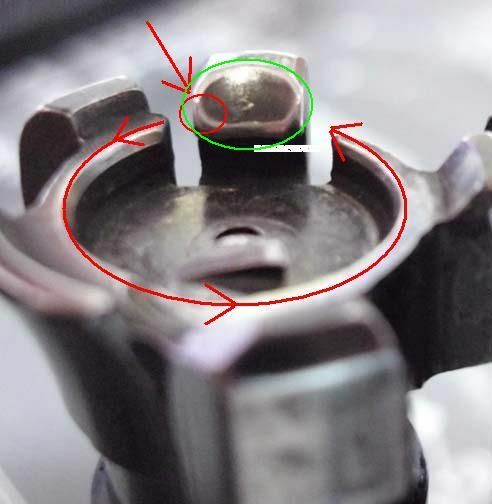 The red circle denotes the rotational leading edge of the extractor... just be sure that this side isn't sharp cornered or it wants to dig into the case rim... remember this condition is only IF the bullet has made it to the chamber without being under the claw, the claw is now trying to pop over the rim, while the bolt is at the end of its rotation. The designed intention is that the new round, as it is being stripped from the magazine, rides up against the bolt face and the rim slips under the claw, but this not always the case when a slide is not operating smoothly. This is not the only cause of failure to return to battery, but it is one of them. The bolt and lock-up is a good design I think, and because of that, I don't think anything too radical is necessary to make a Desert Eagle really reliable. 2. Dirty slide rails and springs/rods. 4. Weak rounds OR low gas pressure causing the slide not to travel back far enough, resulting in reduced forward momentum. 5. New magazine springs with really "rough", "grippy" brass rounds, causing binding against the magazine feed lips and the round below it. That is all I can think of right off... but the most important thing here, is that most of the time, it is a combination of any or all of the above causing an issue. Example... Grippy brass... I used Brasso on some older brass 50AE I had, that were very dark and rather grippy for brass. Nickle cases weren't having any issue, but these were. Polish solved it, but really it was a combination issue. Once I cleaned the slide rails and spring guide rods (remove barrel and then lock slide back, then you can wipe exposed rods) then it would feed the unpolished "rough" brass. I hope this helps... I will try to get back to this thread and add more when I can. I am not going to bash on anyones posts for solutions I don't agree with... so I will say to go with what makes sense. I don't know everything there is to know about making Desert Eagles run as well as they possibly can, and neither does anyone else. I am comfortable that I know enough to make my own guns work very well. To avoid the stigma of keyboard warrior-ism, I will say that I have 11 barrels running pretty much flawless at this point. Although I did retire a couple of American made barrels for reasons discussed in other threads and forums, These are what I have running smoothly... with the exception of the 429DE, which I am confident I can easily tweak the minor issues from. Good info as usual MrBlackCat, thanks for sharing.